Friends of Hillary Clinton who are talking to the media have grave concerns about her health. Not only has she been having these fainting spells for years, she sits constantly with her feet elevated due to some kind of circulation problems. Whats more disturbing they say is Bill Clinton has been begging her to get a complete medical evaluation for what seems like an escalating condition not brought on by a fictitious pneumonia claim. Bill Clinton begged her not to go to the 911 Memorial Service in New York City for fear of exactly what happened, a fainting spell followed by reduced motor functions, in other word the inability to walk on her own, what was more revealing to us at TBRN is the fact she refused treatment at the nearest hospital which is secret service protocol. Instead she ordered her secret service detail to take her to Chelsea Clinton's apartment. Should we remind her secret service detail she is not President, they should have taken her to the closest emergency room and not be involved in a cover up. We've seen enough of it with the FBI, DOJ and the White House. What was even more amazing or stupid is about an hour after the episode she runs out on the side walk of Chelsea's apartment waving and grabbing a child. Doctors said she's sick but feels great. First of all we all know that stunt was stupid and staged. There are two types of pneumonia bacterial and viral if she has viral she should not be touching children its contagious. At this point who knows and from what their friends say neither do the Clinton's who fear the truth worse than they do death. She says she's back on the campaign trail on Thursday, their big fear now is another fainting or coughing spell in front of the public. There's on thing for sure Hillary has never had good judgement, we think this is one of those times because the lust for power, money and fame is overwhelming in their world. We are going to see these episodes again and again if some speculation like Parkinson disease is right.. 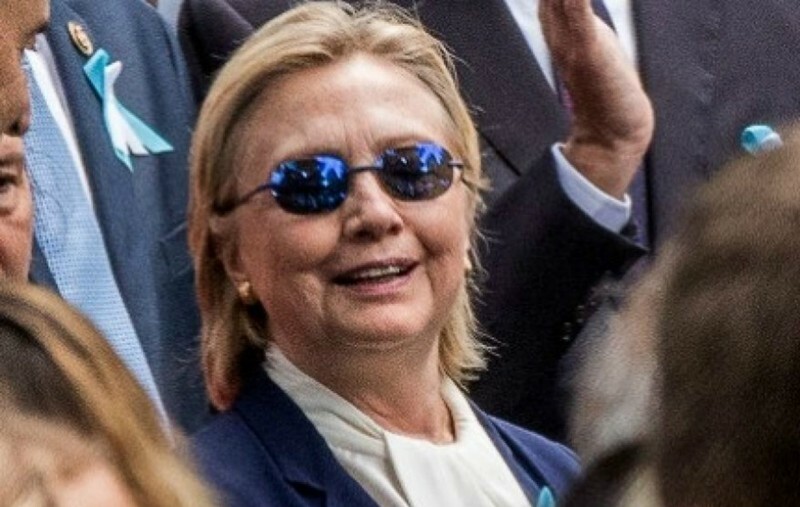 So while Hillary runs around wearing her anti-seizure lenses (Zeiss Z1) blue lens glasses the DNC in the background working on a backup plan should their Ill candidate continue stumbling. They are not sure of the truth surrounding her health and are upset about the secrecy the Clinton's use to hide the truth from everybody. This is their MO, lie, hide, destroy anyone who says different, including their own. The DNC is "stuck". Bill Clinton has taken steps to counter any such moves by the DNC by assembling a battery of lawyers who would sue the DNC. It's in our view this is something other than simple pneumonia, there is obviously a health issue, we've seen it with our own eyes, forget the spin of media, the Clinton lies and the line of doctors willing to put their patients at risk. Can she stand the rigors of the Presidency? Can we handle lies and the secrecy that's surrounds the Clinton's om an everyday basis? Have we had and seen enough? If I were Trump I would run her ragged.. She's Sick..